As you may know, Scott and I are avid thatgamecompany fans, particularly of Journey, their latest masterpiece. It was such a rewarding and almost mystical experience we did not want it to end. Steven Poole, however, thought it should have ended just a tad sooner. 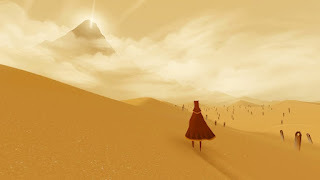 This week on the EXP Podcast, Scott and I discuss Poole's claim that Journey's ending is a "cop out" and, more importantly, examine the way game endings can violate themes and trends established within story and gameplay. As always, we love to hear your thoughts on the subject. Chime in with your comments below! Maybe Journey is akin to Groundhog day, where you repeat the day/journey until you get it right and get a white cloak/win the heart of Andie McDowell. If I might say, your love for colossus, journey, and - based on the header above - katamari, just confirms for me that you guys have excellent taste in games!